Here is another excellent choice for a limited edition Blu-ray by Twilight Time. This is the first time seeing this film and so it was a real treat to experience a new movie. I always enjoy watching a film for the first time. What better way to watch a first time film, than on 1080p High Definition? Twilight Time has done it again in bringing out a wonderful piece of cinema that should be seen. The Blu-ray is a wonderful transfer, has wonderful special features and amazing audio and video quality. 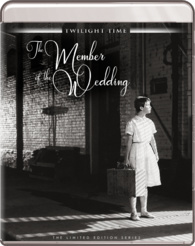 This 1952 drama film is based on the novel of the same name by a very gifted writer Carson McCullers. McCullers was a truly fantastic story teller. Her personal life was a story and tragedy in itself. She in her teenage years suffered from strokes and would eventual paralyze her left side. She died way to young, Her visionary work shines in her many novels. One of my personal favorite books she wrote was The Heart is a Lonely Hunter. If you ever get a chance seek out her books and become amazed by her beauty in words. This stars a vast array of wonderful actors and actresses. The all-around perfect child actor, which this would be his last movie role, the one of kind Dickie Moore. He was true Hollywood and cinema was his visionary reality. From such film classics like 1933 masterpiece Oliver Twist. Dickie Moore was a true piece of the golden age of cinema. In The Member of the Wedding he plays the character of a drunken soldier who tries to take advantage of your main character Frankie played by the wonderful, beautiful and Hollywood master Julie Harris. Harris was the golden ticket of so many wonderful adventures, a 5 time Tony Award winner, 3 time Emmy Award Winner, a Grammy Winner and also was nominated for an Academy Award. A stunning brilliant career. A huge stage actor which might I add, she is in the American Theatre Hall of Fame. Now Julie also played the role of Frankie in the Broadway production before the film production of The Member of the Wedding. I personally will always remember her from one of my favorite spooky horror films 1963’s The Haunting playing the character Eleanor Lance. All one really has to do is name her many films off, such as East of Eden, The Hiding Place, Requiem for a Heavyweight. She was a true goddess of cinema, and it was a fantastic experience seeing her again in a film I had never seen. Now I don’t say this lightly. This also stars one of the greatest masterpiece worthy Actress’s to ever grace the entertainment world. A wonderful, beautiful African American performer that gave her soul and her heart to the world of entertainment. From singing Blues, Jazz and Gospel music to the reality I am writing about, acting. I speak about the one of a kind Ethel Waters. If you ever get a chance seek out her music, you will be amazed. Equally impressive is the man behind the camera calling the direction. Fred Zinnemann needs no introduction, but because of this modern generation, who many persons calling themselves movie buffs, don’t look to the past of cinema, I have to describe a man that should be on any movie buff’s mind. Zinnemann was a director, producer that gave the world masterpieces. Yes, masterpieces. The one and only western masterpiece, 1952’s High Noon. If that doesn’t tell you anything, nothing will. He also brought the masterpiece, 1953’s From Here to Eternity, 1948’s The Search, the amazing 1973's The Day of the Jackel, and 1977’s Julia, which I highly recommend watching just like all the others I have mentioned, and many, many others. Now his, From Here to Eternity, and A Man for All Seasons, both won him, Best Feature Film at the Academy Awards in 1953 and 1966. That shows you his amazing talent, and plus I have to mention that in his vast career of directing, he has directed 18 actors to be nominated for Best Actor by the Academy Awards, and 6 of those actors won for best actor in his films, which is a stunning realization of his brilliance in directing performers. Twilight Time did the amazing job of crafting another wonderful new outlet for this film. Twilight Time has also released two other of his important films which you can read my reviews for them here: A Man for All Seasons and Julia. The plot to The Member of the Wedding is your introduced to Frankie, an awkward girl who is a tomboy, 12 years old and very emotional. She has friends in only her cousin John Henry and her black house keeper Berenice. Now Frankie is mad because her older brother got married and left on his Honeymoon and didn’t invite her to go along. So with her frustrated attitude she decides to run away. She is faced with life head on, from death to growing up. She must find herself and transcend into womanhood through many obstacles. The Black and white is stunning. The imagery is crisp. The sound is vibrant with perfection. A wonderful quality of 1080p High Definition. Isolated Score Track. The man behind the music really needs no introduction. He created one amazing piece after another. From mastery to stunning, to masterpiece music. All one has to do is look at his film scores for such greats as, A Streetcar Named Desire, Spartacus, Who’s Afraid of Virginia Wolf, Cleopatra. I have to mention two of my favorite by him 1971’s Willard score and my personal favorite, 1981’s Dragonslayer. He was a true gifted pioneer of music. His artform stands out above and beyond mere words. Audio Commentary with Singer/Songwriter Suzanne Vega, and Film Historians Derek Botelho and David Del Valle. A very informative and awesome listen. Enjoyed it greatly. Audio Commentary with Carson McCullers Biographer Virginia Spencer Carr. This was a great listen to. Always love hearing more about wonderful authors that given their visionary works to us. A great listen. The World of Carson McCullers. This is great interviews of archival footage. A wonderful watch. Running almost 16 minutes. The Journey from Stage to Film. A program that runs a little over 10 minutes. Comments about the stage play becoming a feature film. Overall this is a Highly Recommended Blu-ray. A wonderful movie with stunning performances that truly stay with you long after the film is over. Twilight Time has done another amazing job at bringing a worthy film to the masses of this new generation and of the older generation. Amazing quality in audio and video, wonderful extras. A top notch brilliant example of how to treat an older film.